Brimmer relies on the voluntary support of its community to maintain excellence today and secure a vision for the future. 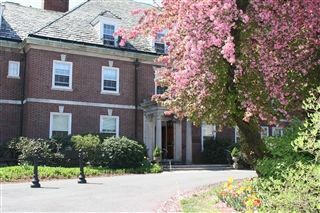 Brimmer and May’s primary source of revenue is tuition, but tuition alone does not cover the full cost of educating each child, and the School relies on philanthropy to cover that gap. Voluntary support for Brimmer and May comes from our generous donors including current parents, parents of alumni, alumni, grandparents, trustees, faculty, staff, and friends. Annual Fund gifts provide critical support for operations during the current school year, while endowment, capital gifts, and planned gifts provide for our future by supporting new and updated facilities as well as for endowments for financial aid, faculty salaries and benefits, professional development, and special programs. Please click here to learn more about ways to give. Brimmer’s Development Office follows the CASE (Council for Advancement and Support of Education) industry standard Donor Bill of Rights and stewards all gifts, keeping our generous donors well-informed and honoring their intentions. Growing up in Oklahoma, Elizabeth was introduced to independent schooling at an early age as both of her parents were independent school educators. Before joining the Brimmer team in 2011, she was the director of annual giving and a campaign strategist at a junior boarding school west of Boston. Prior to that, she worked in advertising and marketing for 15 years as an account director at several Boston communications firms. Elizabeth looks forward to using her marketing, strategic, and relationship skills to achieve meaningful goals at Brimmer, and was particularly drawn to the School’s mission of developing informed, engaged, and ethical citizens and leaders for the global community of the 21st century. Elizabeth is a member of the Council for Advancement and Support of Education (CASE), the National Association of Independent Schools, the Association of Independent Schools in New England, and Women in Development. She has been the class agent for her Amherst College class for 25 years, and served as the reunion chair for her 10th and 25th reunions at Amherst. When she is not at Brimmer, Elizabeth enjoys reading with her book club, walking her dog, cooking, and spending time with her children and family. As an educator, Sharin aims to promote lifelong learning and engage students in asking why history impacts who and what we are today. Her international perspective was formed early on as her mother was an educator at the United Nations School and Ethical Culture School. Sharin has been a member of the Brimmer community since 1982 and is a member of the Brimmer Administrative Team. In 2011, she traveled with colleagues and students to China and South Korea as part of Winterim, an educational travel program. She loves the School’s class size, collaborative nature, and positive parent-teacher-student relationships, as well as the opportunities to take on leadership roles and opportunities. Her ability to work in a warm, stimulating environment of students, colleagues, and families is what she likes most about working at Brimmer. Sharin is a certified Master Teacher and a member of the National Association of Independent Schools and the Association of Independent Schools in New England. In 1990, she was honored with a Grade 4 co-teaching achievement by the Brimmer Alumni Association. In her spare time, she likes to travel, play golf, cook, and listen to opera music. A Boston native, Amanda has been part of the Brimmer community since she was 13 years old. She took the T out to Brimmer every day until she graduated in 1988. She loves working in education, especially for her alma mater. Amanda worked in Admissions and Alumni Development before becoming Director of Alumni Affairs and Special Events. Amanda is also responsible for starting Brimmer's curling team and serves as its Head Coach. She loves the closeness of the Brimmer community, and being close to her daughter Marlo, who is a Brimmer student. Amanda is a member of the Council for Advancement and Support of Education, and the National Association of Independent Schools. In her spare time, she has served on a steering committee for Bennington College, and Brimmer’s Alumni Board, and has volunteered for the St. Bernard Project in New Orleans. Amanda also loves rehabbing her house in Vermont circa 1750, fishing, being by the ocean, and spending time with her family. University of St. Joseph - B.A. Anne grew up in West Hartford, Conn., and moved to the Boston region 20 years ago when her daughter was one year old. Most of her family has been involved in education, so she believed it would be a good industry in which to work. She has been a member of the Brimmer team since 2015. Anne loves the work ethic and community feel at Brimmer, regardless if one is a member of the faculty or staff. In her spare time, she enjoys playing golf, paddle tennis, and doing needlepoint.